Do Dental Crowns Last Forever? At A Supa Smile we use dental crowns (sometimes called caps) in many restorative treatments. A crown adds strength to a tooth that has a large filling or has been injured, a crown can correct bite misalignments, and a crown is usually necessary after a root canal. Because crowns are so useful and long lasting, patients often ask us, “How long will my crown last?” And of course, the answer is that there is no single answer. What is true, is that getting your crowns from your trusted A Supa Smile dentist, is one way to ensure that your crown will last for the longest possible time. Here are some things to be aware of when considering a dental crown. One thing worth pointing out is that many insurance companies pay for crown replacement if failure occurs after 5 to 8 years. At the same time, dentists often estimate that a crown should last from 5 to 15 years. 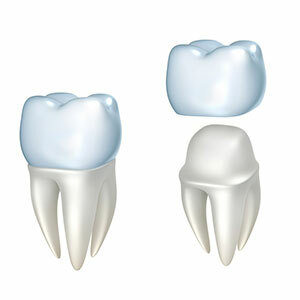 Dentists are also generally clear that crowns are usually not permanent. Dental crowns can last for decades or more. One study tracked the success rate of 2,340 crowns installed by a single specialist and discovered that 1,989 out of 2,340 crowns lasted over 25 years! The study showed that at 10 years, the success rate was 97% (2270 crowns that lasted longer than a decade) and at 25 years, the success rate was 85% (Walton, 2013). These results demonstrate that given proper crown materials, good manufacturing, and expert installation, the chances for long-term retention of a crown are very high. However, 3% did fail within 10 years, and 15% did fail within 25 years. This is a reminder that long-term retention is not a certainty and that we should take proper care of our teeth, especially those with dental crowns. Appropriate Diagnosis: Dental crowns are not always the best solution to your dental issues. We recommend them if we are certain that they are the optimal solution with the highest chance to successfully address your dental condition. Appropriate Materials: Depending on the location of the tooth or teeth to be treated, the cosmetice desires and bite characteristics of the patient, A Supa Smiles will recommend the appropriate material and construction of the crown. Zirconia is extremely durable, but it is not always the appropriate choice. Our trained professionals will sit down with you and determine which materials will be best for your particular situation. Expert Installation: A Supa Smiles has installed dental crowns on many patients and we are quite cognizant of what is needed for a successful procedure. We make sure the tooth surface is dry and properly textured before placing the crown. We also use only the finest cements available to assure a long-lasting and strong fit. At A Supa Smiles, we give our utmost effort to provide a pain free experience, no matter what treatment is being performed. Home Care: We work with you to attain the highest level of oral hygiene and protection for your dental crown. This includes proper home care, which is a key factor in your crown’s longevity. The healthier your mouth is, the better your chances of having a problem free dental crown for many, many years. We offer interest free payment plans – fortnightly or monthly payments, on treatments above $1000, over max term of 3 years. We prefer minimum payment of $100/month. New or existing patient, we invite you to take advantage of our amazing offers. Find out more by visiting our special offers page. Contact us today on (03) 9723 0703 or book your appointment online TODAY!